Early this morning we're shocked with the news that one of the active volcanoes of the world once more manifested eruption. One of the features of Mayon is its unpredictability in terms of eruption. Mayon, about 330 kilometres (200 miles) southeast of Manila, has record of more than 40 times notable eruptions. One of the unforgettable of the eruption happened in 1814, wherein more than 1,200 people were killed when lava flows buried the town of Cagsawa. In December 2009 tens of thousands of villagers were displaced when Mayon spewed ash and lava. The Eruption happened today is far different from previous eruption because there were NO any human indications manifested. The eruption is called as Phreatic Eruption, also called a phreatic explosion or ultravulcanian eruption, occurs when magma heats ground or surface water. The extreme temperature of the magma (anywhere from 500 to 1,170 °C (932 to 2,138 °F)) causes near-instantaneous evaporation to steam, resulting in an explosion of steam, water, ash, rock, and volcanic bombs. As of now we are praying for the lesser effect and causalty of the said erruption. About 9:00 in the morning today, Mtr. George Cordovilla, the "Tiger of Mayon" called Pastor Reynold Boringot to give update on the said eruption. This is the update posted by Pastor Reynold from Mtr. Goerge after few minutes of conversation. "Update from Mtr. 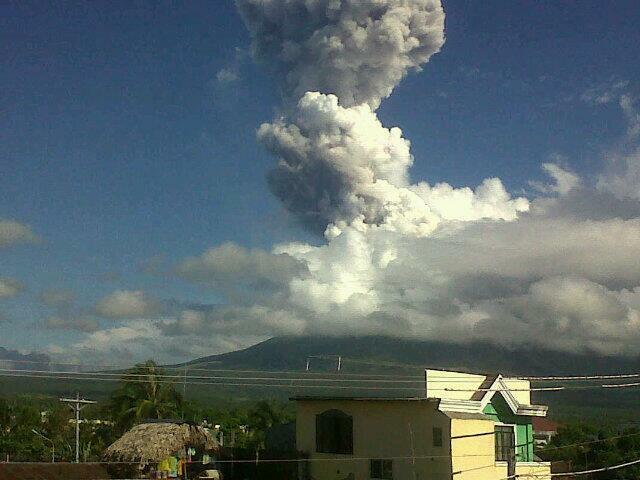 George De Mesa Cordovilla of Mayon, it's past 7 am this morning Mayon Volcano erupted. They are in the "Hagdan" area of Malilipot trail when eruption occurred. Two dead from Malilipot trail and sad to hear that his porter/ co-guide Bernard from Sto. Domingo will cut one of his hands because a fallen rock from eruption hit it. They are now descending to camp one and the medical team from various organizations and individuals- Arne Buere and the rest of the Albay Triathlon team are now doing rescue operation. Let us continue to pray for the safety of the mountaineers and also for lesser impact of the eruption to the lives and living of the people of Albay." Let us continue to pray for the families of the dead victims and also to the casualties. Once more, Philippine Institute of Volcanology and Seismology (PHIVOLCS) or even the Provincial Tourism Office of Albay of Governor Joey Salceda is not declaring closure of Mayon Volcano for the mountaineers.